When Jemima Khan tweeted a denial that she had taken out a super-injunction to suppress pictures of herself with Jeremy Clarkson, she unwittingly poured petrol on the flames of the growing row over how Twitter is being used to get round gagging orders being taken out by the rich and famous. Her first tweet at the weekend ran: "OMG - Rumour that I have a super injunction preventing publication of "intimate" photos of me and Jeremy Clarkson. NOT TRUE!" Then: "I have no super injunction and I had dinner with Jeremy and his wife last night. Twitter, Stop!" On Monday morning, she tweeted again: "I've woken up trapped in a bloody nightmare." By then, she was responding to stories in newspapers and other media - including BBC News - that a Twitter user had named several stars who had taken out super-injunctions. The Daily Mail splashed the story on its front page: "Gagging law stars 'outed' on Twitter: Thousands see the names of celebrities alleged to have taken out injunctions." The Daily Telegraph printed pictures of Khan and Clarkson on its front page under the headline "Gagging order? 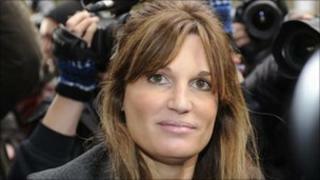 Not me, says Jemima." Some experts professed surprise that the naming of super-injunction stars had suddenly become such a big story. The BBC's Rory Cellan-Jones, on his personal Twitter feed, wrote: "Rather weird that Twitter has been alive with super-injunction details for weeks - but one new account with inaccurate reports is news." This was picked up in turn by Roy Greenslade in his Guardian blog: "The sudden discovery that the names of various people whose identities are protected by injunctions are available on Twitter is baffling. Names - some accurate, many inaccurate - have been flying around the net for weeks." Two factors brought the gagging orders story to the fore: A concerted attempt by one Twitter follower to pull together several of the names in a short burst of tweets. And the fact that Jemima Khan denied it, allowing the wider media - newspapers and broadcasters - to peg the story on a known celebrity (albeit one who was wrongly named). When she tweeted again, saying she'd had "vile hate tweets", it made further headlines on newspaper websites, which were then retweeted hour after hour. The Twitter account that started the stories attracted ever more followers - 44,000 at the time of writing - and that in turn became news in the circular world of Twitter. It is now accepted that sites such as Twitter have put a huge strain on the ability of the courts to enforce super-injunctions and other gagging orders. The point about super-injunctions is that - unlike conventional injunctions - no one is meant to know they exist. The Catch-22 conundrum is that many organisations in the media have to be told the details so they don't unwittingly publish them. In the case of Andrew Marr, who recently revealed that he had taken out a super-injunction, many journalists knew already. Twitter makes it possible for what used simply to be media gossip to travel round the world. The problem - as with much media gossip - is that much of it is untrue. And whether it is or not, once the genie is out of the bottle, it seems impossible to put it back. You may be able to remove the original tweet, but once it has been retweeted, often many times, it will continue to be traced. Is there any legal redress? Publishing such details may be regarded as contempt of court and the legal system is starting to get to grips with publication on the web. Recently, the High Court convicted the Daily Mail and the Sun of contempt of court for publishing on their websites a photograph of a man toting a gun during a criminal trial. According to the UK Human Rights blog, it was the first such case of contempt relating to an online publication and carried the ominous warning that "instant news requires instant and effective protection for the integrity of a criminal trial". But there is a difference between protecting the integrity of a trial and that of a gagging order. There is also a difference between publication by well-known newspapers on the web and unnamed individuals on Twitter. And ultimately this comes back to newspapers. One reason that the Twitter story has been so high-profile is that several newspapers - including the Mail and the Telegraph - have been campaigning against super-injunctions. Phil Hall, former editor of the News of the World, now a media adviser says: "The whole campaign is about newspapers winning the right to publish sensational stories that sell their products. "But just because it is not possible to police Twitter, it doesn't mean that the media at large should be able to publish any story they wish, however private." He says: "There is a vast difference between 20,000 Twitter viewers reading a false rumour on the net - particularly as the public take what they read on the net with a pinch of salt - and a story read by 10 million in a newspaper and on its incumbent website." Those kiss-and-tell stories may be the ones that are occupying the newspapers and Twitter-followers at the moment. But it should not be forgotten the first case of Twitter followers breaking the power of a super-injunction was very different. In October 2009, the oil firm Trafigura tried to block publication of a parliamentary question about its activities - and tens of thousands of Twitter-followers helped expose it. That was the first time most people had heard of a super-injunction, and it hasn't been the last. Are celebrities gagging the media more than ever?